Before proceeding below – download this MINDMAP and follow along. – Wesley Atkins. If you already have a business doing well, you’re happy with your results, and enjoy the market you serve – this is not for you. Likewise, if you are a Fiction author, and have no intention of creating a business outside of that – this is not for you. For everyone else … read on. First, it goes without saying that entering niches and genres that you have an interest in is rather, well, critical – IMO. So is making a living, right? And, yes, most people’s interests may not align with profitable book topics. So, how do we balance the two? … you just have to keep digging to find something that “matters” to you and is proven to show DEMAND. … it rarely is as clear cut as that. You’re reliant on one platform: Amazon. You have to constantly churn out books to grow – and in some cases, maintain – your income. Now – and this is my opinion – that doesn’t mean you can’t (or shouldn’t) enter multiple niches and genres. I recommend you build out a “business” in *one* market FIRST. By that, I mean a “real” business. Multiple books in the same market. Ongoing relationships … and, maybe even coaching and consulting. When you hit your income goal in *one* market – by all means, build another business. Not a revenue stream … a business. You are setting income goals, right? Spend some time away from the computer, get clear on *what* you want and *why* you want it. Whatever it is, get clear on it. Saying you want to earn a million dollars a year with no clear reason behind it … is just a dream. Aligning it with a reason “why” (and *how*, but we’ll get to that) gives your brain the “hook” to work it’s magical prowess and bring your goals into reality. So, note down “what” you want (income goal) and “why” you want it (emotional reason that’ll spark action). Put that sucker next to your computer so you see it every damn day. BTW … the “how” starts tomorrow, when we validate your market(s). List as many ideas of niche markets that you have, at least, a “small interest” in. Everyone tells you to follow your passion. …and/or they don’t align with anything that’ll make you a living, then you’re just wasting time and money. It’s pretty easy to become passionate about the subject, believe me. For that reason, spend some time away from the computer and list, list, list. Write down everything you can think of that interests you in some small way. Because, tomorrow, we need to VALIDATE which ones are going to be, well, “fruitful”, shall we say. There’s nothing more frustrating than spending weeks and months writing a book, and/or building a business that doesn’t produce any “coin”. That’s the quickest way to doubt your ability and “quit”. You’ve never had a greater opportunity in front of you. Global e-commerce from a $500 computer in your home would have been laughed at just 20+ years ago. Amazon sells 1.2m Kindle books a day. Linkedin acquired e-learning platform lynda.com for $1.5 billion in 2015. E-learning was quoted back then as a $107 billion industry. Think you can get a slither of that when you create a real business with your book(s) outside of Amazon? Oh, what a wonderful thing. If you missed the email (preface) I sent yesterday, read that first. Before reading on – if you’re serious about this – please follow the steps in the previous email and make a note of your “what” and “why”. You’ll also want to have a list of potential niche markets to VALIDATE. Validation of a book idea is arguably the most important step before you ever think about writing a book. Like a house, if your book is built on a weak foundation … it’ll likely flop. We’ll talk about “Empathy” later, for now, let’s talk about “data”. One of my earliest mentors online said something that never hit home to me in the beginning – but boy do I wish I took it seriously. The biggest mistake I made – and still see people making – when releasing new books was validating ideas with Google keyword research alone. Sure, Keyword research has its place, but not for validating demand. You want people to vote with their “credit cards” not search volume. In the UK, we love our takeaway of fish and chips. Not a fan personally. But, it’s “the” thing to get on a Friday night. Greasy deep fried fish and chips. The most popular fish in order – cod, haddock, and rock. … I’d undoubtedly lose out on sales to a competitor and go bust pretty quickly. … but, so many authors and entrepreneurs want to reinvent the wheel and think if their idea is already taken, they need to come up with a new one. In fact, competitors (and lots of ‘em) are a good thing as it proves demand. Don’t be scared of competitors. Offer a new twist on an idea. … (good luck with that), then by all means ignore my advice and look for under-served keywords to target a book idea. Let people vote with their credit cards, not keyword searches. Amazon sells 1.2 million books per day. There’s no better data available on what sells as they have a little thing called – The Best Seller Rank. This is essentially a unique number assigned to each book which updates hourly and correlates with book sales. The lower the number, the more books that are sold. … entering markets and niches by writing books that actually make money becomes a lot easier to identify. Every Kindle book is assigned multiple categories by Amazon, our job in validating markets is to scan these categories and sub-categories to look for popular niches. However, scanning hundreds of categories (did you know Kindle has 38k categories in the USA alone?) can take a looooooong time. 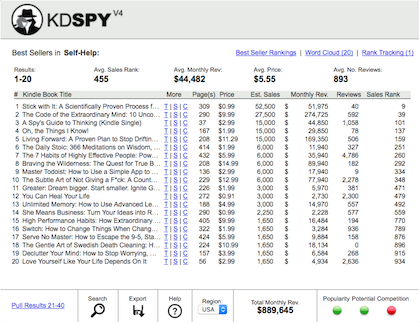 You know all this, that’s why you purchased KDSPY. Anyway, what we are essentially doing is looking at DATA. We’re specifically looking for promising “top-level” categories to validate a market. For me, I like to see that the last book on a given category page (Ie: book no.10) is under a bestseller rank of 20,000. I also like to see that at least half the books on the first page have at least 50+ reviews. That’s a good sign of some healthy data on “how” people are voting with their credit cards. Then, we’re free to drill down into the sub-categories to look for more “specific” niche topics to write around allowing us to compete and sell. Would no longer appeal to anyone as it’s too broad and overused – pretty obvious, right? So, we need to dig into the sub-categories and see what “specific” topics are showing demand. Imagine overlooking a stadium of 50,000 people. All those people are interested in ONE thing. The one topic/category you’re browsing. Let’s take, for example, SELF HELP. So, let’s make a couple assumptions. Here we have 50,000 people in this stadium looking for Self Help stuff. I know I can help them if I just knew precisely what they would buy. Ie: what they truly WANT. More on that in an upcoming lesson. A quick look at the main category shows how incredibly popular this market is – with books selling 1000s of copies. The first 20 books are all under a <1000 bestseller rank. Check. At least half the books have over 50 reviews. Check. I’m interested in the topic. Check. Bang! I’ve just “validated” a market. (don’t overthink this stuff). Now … we need to identify what “specific” sub-niches and topics are standing out and see where we can gain an entry with our book. Tomorrow we’ll dig into just that. Hope this is proving useful. Just a heads-up – today is a long one. No getting around that, I’m afraid. BTW, I had an email last night from a customer in Northern California. If you are in that area – my heart goes out to you. It seems the wildfires over there have already claimed 40 lives and parts of the state are looking like a total war zone. How people must be feeling coming back to “nothing” is incomprehensible. My thoughts and prayers go out to you and your family if you’re in the midst of the devastation. A few short weeks ago it was the flooding in Texas. Now, this. With a saddened demeanor, let’s get onto today’s lesson. So, by now you should have “validated” a broad market that interests you based on “data” (people voting with their credit cards). Let’s move forward with yesterday’s category example – Self-Help. This category is shifting a serious amount of books. It’s competitive. So … finding a sub-niche and standing out from the competition is critical. Think of yourself as a detective. You’re overlooking a stadium of 50,000 people who are all looking for “Self-Help” stuff. Our job as the detective? Identify the *pockets of people* that have “specific” needs, wants, struggles, fears, hopes, and dreams (desires) … whatever they may be. In any market or category, there are potentially hundreds of them that exist. Your book cannot *create* desire. We need to “attract” our target audience that already has these hopes, fears, and dreams of a solution. (We’ll talk even more about 2,3 & 4 in the next lesson). All we’re doing here is digging into sub-categories. … and identify all the “specific” needs and desires that are popular by looking at the similarities in the book titles. Obviously, I can’t show all these examples as this email would be 20 pages long. Imagine, however, the stadium broken up into multiple sections – north, south, east, and west. Within each, are even more segments. Top tier, middle tier, lower tier. … can more easily understand their challenges and get to the root of their desires – as now, we have a smaller segment of people to work with. So … after all that segmentation, we stand back and observe. We’ve identified a group who’re all deep in conversation with each other. … and interestingly, it’s not the largest group, but it certainly has the most activity going on with people discussing their particular problems. Let’s go over and see what they’re talking about. Hmmm, all these people are talking about Stress Management. … plenty of reviews (hint: discussions). (And no, you don’t need to find all 3 green lights, this was just an example that worked in our favor. If your market is showing as too competitive, just keep digging to find a couple categories with the most potential/popularity and least competition). The books all have good sales volume. And … based on the last book on the first-page (BSR of 14,025) we only need to sell six copies per day to get a first-page listing here and overtake that position. We’ve found a sub-category where we can compete. But – here’s where most people stop. 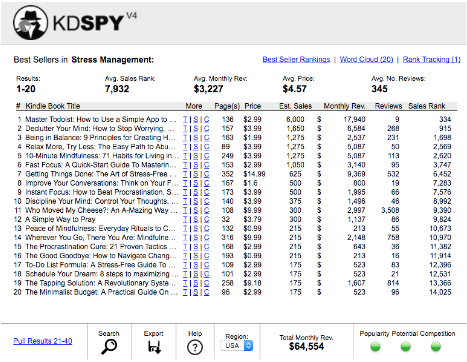 They’ll take the keywords in the book titles and model their own based on those keywords and the word cloud in KDSPY. (I’ll spare you all the screenshots). WAIT! – our detective hat is not ready to come off, yet. Just modeling a book title, and not “empathizing” with your target audience and understanding their real *why* (desires), is why most books fail. There are potentially many reasons why people are looking for stress management. We need to dig further. In our stadium example – we’ll hang around these people and listen in on their discussions to see what further segmentation is possible. Seems to point to the fact that people feel they are not getting enough done – maybe in their work/business lives – and it’s causing them *stress*. Maybe this is a result of overwhelm – which leads to procrastination. Then, we get nothing done, and the cycle leads to stress on a massive scale. In a similar vein to procrastination, if we feel overwhelmed, we often drift and lose discipline in our lives and daily routine. Seems to point to the fact that people have so much “head junk” and need to quieten their mind to feel normal again and get on with their life/business. * In our stadium, we’ve segmented people from “Self-Help” into multiple locations all with the “similar” struggles, needs and wants. (sub-categories). * We noticed the “Stress Management” sub-group in deep discussion, and interestingly, it wasn’t the largest of the group’s (popular with low competition). * As the detective, we’ve heard the conversations and identified the broad topics of this sub-group (similarities in the titles – word cloud). Now … our job is to listen even more closely (dig deeper) and identify – in their own language – the emotional hot buttons in each of the topics. The specific reasons *why* they are stressed. To gain an understanding (empathy). Armed with that knowledge, we can “more effectively” offer them a unique (not always possible) and specific solution – that get’s attention. Let’s brainstorm, first, and play around with those assumptions above. …and it’s inevitably leading to overwhelm resulting in procrastination and stress? … that they end up searching for mindfulness techniques to gain some peace of mind and clarity? There could be many more specific reasons, too. But, they are all “assumptions” at this point. Write down all the assumptions you have about your target audience. This exercise helps really train you to empathize with your audience. At this point, we can use Keyword research (Amazon Kindle Store) to help craft these assumptions by looking at the specific search strings people enter on Amazon. We do this with “Amazon Suggest”. (… obviously, these are the keywords you’ve identified for your market). Type them into Amazon … then, you’ll see the suggestions, ranked in order of popularity as to what people are searching for in the Kindle store. These specific searches can yield golden insights when forming assumptions. Our goal (tomorrow), is to “backup” those assumptions. So – we’ve segmented the stadium and placed our sub-group in one location, so we can easily approach them for more insights. (tomorrow). For now, just write what comes to mind. We’ll listen in (not literally) on the conversations tomorrow to backup our assumptions and improve upon them. Many people make the mistake of “blindly” using keywords from other book titles and stuffing them into their own. Or writing book and titles solely to get ranked for *one* under-served keyword. Doing this is like shooting fish in a barrel. In some cases, there’s nothing wrong with using keywords in your title … but it has to be in context. It has to be compelling. It has to get attention. Without empathy – your title, sub-title (hook) will not attract … and your book description will not persuade your target customer why they should listen to you. This is what separates books that sell, to those that flop. To gain it (empathy) we use a little something called – Qualitative Analysis. It seeks to put you in your customer’s shoes. A book title that gets ATTENTION. A book cover that gets the CLICK. A book description & TOC that gets the SALE. Qualitative Analysis is our weapon. Tomorrow we enter the battle (for attention). TIP: When making assumptions about your target customer, don’t forget to look at what “other” books they buy, too. You can do this by looking at all the books in your chosen sub-category and looking at the “people also bought” section of a Kindle book page. Before the next lesson (tomorrow), make sure you finalize your topic selection by identifying a sub-category where you want to compete. 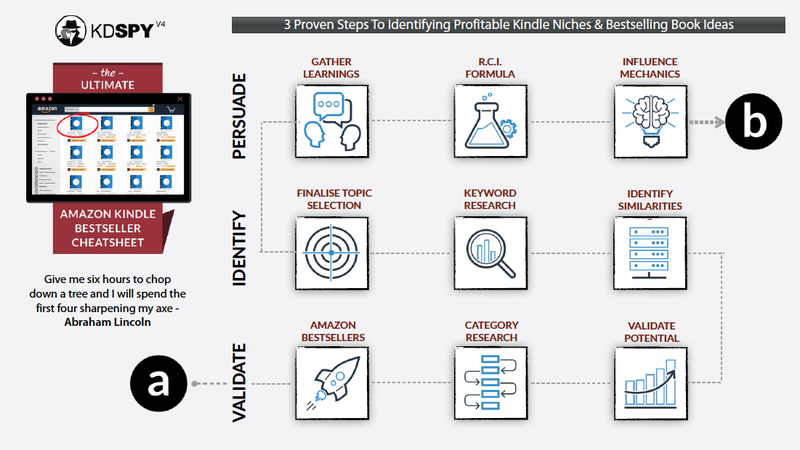 Here it is – the final lesson in the “3-steps to IDENTIFYING profitable Kindle niches and bestselling book IDEAS”. This email is 2,656 words. I make no apologies about that. Market research is either a skill you want to master – or it’s not. Reading this email assumes you’ve already read the prior emails. If that’s not the case … this email will not make sense. Please ensure you search your inbox for the above before proceeding. Over the next several days – if I get enough feedback – I’ll be going through any questions you have and “amending” these lessons. Writing these emails in one sitting comes with obvious mistakes and areas where things could be, well – explained with more clarity. Your questions will help shape these lessons into a “clarified framework”. If I get at least 50 responses, I’ll improve this for everyone. You’ve VALIDATED a broad market you have an interest in. A market that’s voted with their credit cards and thus has potential. You’ve IDENTIFIED a sub-category (narrowed down the market into a niche) of people you want to help (serve) with a solution. Within that subcategory, you’ve “segmented” the audience even further based on specific DESIRES – needs, wants, problems, etc. Think of these as the END RESULT. What specific “end result” is your target audience looking for? Well – you not only need to find out – you need to understand *why* they’re looking for this end result. As in – what emotions are they feeling? If you understand what MOTIVATES them to SEEK their solution (end result) in the first place – and what language they use – you’re in a better position to more effectively communicate, resonate, and articulate your unique solution. Because this level of analysis is what your competitors are NOT doing. Give me six hours to chop down a tree and I will spend the first four sharpening my axe” – Abraham Lincoln. Because it’s a level of Analysis (Qualitative Analysis) that most authors and business owners don’t know about or understand how to perform “effectively”. Yesterday, based on the segments of your “narrowed” target audience, you should have – if you followed the lesson – crafted a few assumptions. Today, you need to CONFIRM and/or amend those assumptions. The best way to do that with “Qualitative Analysis” – in order of effectiveness? Face to face conversion – allows you to ask multiple questions to capture their language, emotions, struggles and required end result(s). Feedback question polls – ie: What’s the No.1 struggle you have with “X” – you get to capture the one thing they need help with. Targeted forums – allows you to spy on the popular conversations and dig for the needs, wants, struggles, emotions, and language used. I wanted to give you an education in the MOST effective form of QA. If you go to this level, you’ll gain insights you’ll not get anywhere else. Fortunately, most niches have targeted forums where our audience hangs out and – all archived – what exists, is a treasure trove of INSIGHTS. Struggles, dreams, hopes, and aspirations all waiting for you to capture the voice of your target audience and use in your “marketing”. All you’re doing, in summary, is gathering INSIGHTS about what your target audience “wants”. Then capturing their language and emotions to offer them a book that’ll RESONATE above those available in the Kindle store. I hope you see now “why” going into ONE market (initially), is important. There’s a level of market understanding that’s needed to COMPETE. You cannot reach that level unless you’re involved, focused and committed to that market and tailoring solutions “specifically” to them. So … back to our example. Yesterday, we chose “stress management” as a subcategory where we can compete. (hopefully, you’ve chosen your’s). Now – you “could” take an in-depth look at the top five to ten books, and see what they are doing … in order to model your own book with a unique angle. And while that “may” allow you to compete, you don’t get the whole picture. You don’t understand *why* those books are selling. From our stadium example (previous lesson) we want to “listen in” to the discussions and “capture” their real problems, struggles, desires, and emotions. In our example, we’ll search for “Stress Management Forum”. Hmm, not a typical forum per se, but here we have 1,898 posts and 2,532 members who are all posting about their struggles. Say it with me – G.O.L.D. Now, this is one example for the sake of a twenty-page email, but you’ll want to mine your specific targeted forum(s). (Not just one). Who – who are your ideal target audience? (old, young, male, female). What – what are they looking for? (needs, wants, solutions). Why – why they want the solution? (capture the language, emotion). SIDENOTE: You may want to gloss over the WHY – it’s probably not something you’ve considered before. Well, the WHY is the most powerful driving force behind human behavior. It explains and justifies pretty much every – often subconscious – decision (book purchase) we make. All we’re doing is capturing these INSIGHTS into a notepad, word-doc, spreadsheet, Evernote … whatever. Again, for sake of space, I will paste a few insights from our example (you want many). You start to “empathize” with your audience from their POV. In their shoes, what makes them “tick”, what their MINDSET is like. There are no “rules” for this – it’s just important that you do it. What you gain will be different for every market and situation. You can go as in-depth with this as you like. The more the better (insights). At a minimum, I recommend you capture at least 200 (very selective) responses. Now – if you want – you could segment these insights into a spreadsheet with three columns for your who, what and why. Then, ANALYSE and start to empathize. For the sake of endless examples, here’s a summary. …you want a lot more examples than this – and you also want to capture the entire sentences (language/emotion). TIP: When looking at forums, some platforms will allow you to sort the discussions (threads) by the “post count”. This can give you a great insight on the “most popular” discussion topic(s) for your book idea(s). BONUS TIP: Once I’ve collected these insights, I, personally, like to START writing bullet points “right away” to resonate with these struggles for use in my book DESCRIPTION later. * How to remove that anxious, “sick feeling” in the pit of your stomach when anxiety becomes to much – WITHOUT drugs or nasty side effects. * Racing thoughts? Here’s how to INSTANTLY put yourself in a “state of bliss” by mastering the power of this secret ANCIENT meditation technique. They took me literally one minute to write each. The more you have the BETTER. Not all will be used. Obviously, you’ll need to choose the ones in context to the “specific” topic/audience you’re targeting. However, you’ll want to add these to an “ever-evolving swipe file” for use in later books and marketing material. So, how did you do with your assumptions? In our example – from yesterday – I think I did quite well, apart from one insight that I never considered – Students. The board was *flooded* with university students that were stressed with their exams and managing their time. Personally, I don’t like to enter markets that have no disposable income (students) but, it’s worth investigating. Because … we’re looking to identify “multiple” ideas for books. Why settle on one, when – over the course of time – we can launch several in this niche. That’s why this research is invaluable – you only have to do it ONCE. Shows that indeed my assumption is correct. Poor sales. No potential. It appears from digging a little deeper that students would prefer to spend their money on video games, harry potter books etc. So, let’s stick with what we have, for now. You want to know *why* the best-selling books in your chosen subcategory are selling and improve (your USP) on “their” influence mechanics. This stands for Repurpose, Combine, and Improve. It’s a little formula I created that allows us to understand “why” (repurpose) books are selling, model the “successful” components (combine) and “improve” on everything based on our own RESEARCH. The first-page of books in a given (popular) sub-category are bestsellers for a reason, right? Obviously, the market resonates with them. We could simply create our own (and better) version of what already exists. BUT – without understanding *why* they are selling – you’re immediately at a disadvantage in creating an effective (unique) means of attracting your target audience and, persuading them to listen to YOU. TOC: Use the look-inside feature and do a screenshot. TITLE & DESC: Screen grab the book page w/ title, subtitle, and desc. Forgive me for not showing examples. I think you can understand why. Just print out the above for the bestsellers and keep everything – including your research and insights – into an organized folder. This will be an “ever-evolving” swipe file of ideas, understandings, and insights about the niche market your plan to help (serve) for the long term. So, what are we doing with this competitor analysis? Simply highlighting the components that you want to USE. The words, phrases, insights, structure (description/TOC) and language – based on your own research – that you believe are the effective persuasion elements. Based on your market analysis (QA). Ie: what is it your competitors are doing well? Highlight all the words, phrases and chapters/sub-chapters (TOC) that you believe are the result of them RESONATING with your target audience. Most – not all – of them will NOT have done the “in-depth analysis” you have. You’re ONLY modeling the parts of their title, sub-title (hook), description and TOC that are – based on your research – necessary, useful, persuasive and effective. … results (of your readers), raving fans, recommendations, and REVIEWS become easier to gain as you know precisely what they WANTED and you’ve delivered it. In spades. On the subject of reviews, this adds another LEVEL of insights. Understanding what readers of your competitors LIKED and DISLIKED about their book(s) prevents you from making the same “mistakes” and ensures you cover the areas (TOC/book content) they liked. Tip: When modeling and crafting your own TOC, be mindful of the “questions” you’ve identified in your QA analysis. Sometimes these can make for excellent chapters/sub-chapters. Also … the closer you can get to a “step-by-step” solution in line with what your target audience truly WANTS (end result/desire) – the more your reader will experience true “results” from your book. Leading to raving fans, reviews and repeat sales. To get their intended END RESULT. Ensure this comes across in your TOC and book description. The beautiful thing about QA – outside of analyzing the bestselling books – is the titles, angles, hooks and new book IDEAS you can gain. Of course, you need to do your due diligence to backup the potential. But, this level of analysis is so worth it for the “long-term” success of, not just your book ideas, but your business as a whole when you get to the next level. By the next level, I’m talking about offering “additional” products, services, courses, and consulting from your OWN platform (website). That’s what will take you from Author (reliant on Amazon) to Authorpreneur. A business where you control the customer list and the relationship. It goes without saying – the initial success of your book will be based on how well you can effectively CRAFT your own persuasive “Influence Mechanics”. Book cover (get a pro designer). Which, I’m sure you can appreciate is *all* outside the scope of this email series (it will be never-ending). Entire courses have been created on these specific individual topic(s). But, with your QA analysis – you have all the “data” you need to PERSUADE your target readers that you have a solution worth paying attention to. The bestsellers are there waiting for you to model & improve upon. That, my friend, is the 3-proven steps to IDENTIFYING profitable Kindle niches and bestselling book IDEAS. Your “detective” skills (QA) have now been honed. But, always, always, sell what’s already selling!